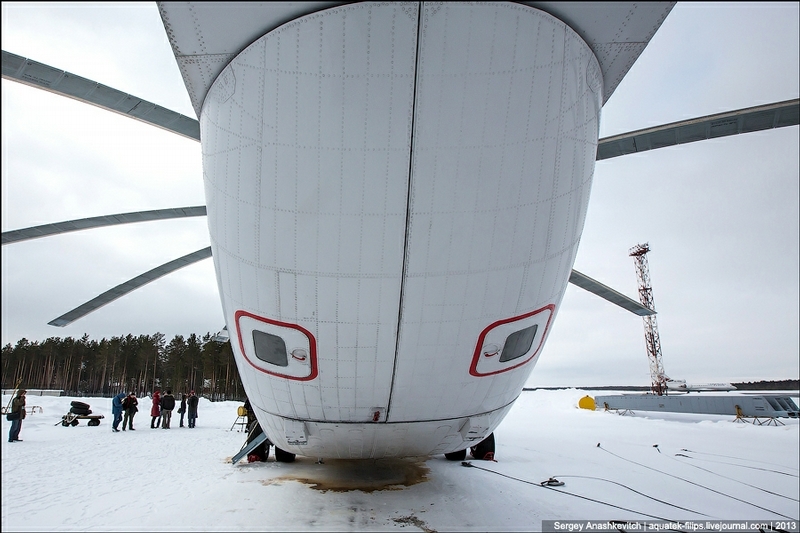 Welcome aboard the biggest serially produced helicopter in the world! You will be surprised but if you place it near an airliner Boeing 737, it will be even longer! 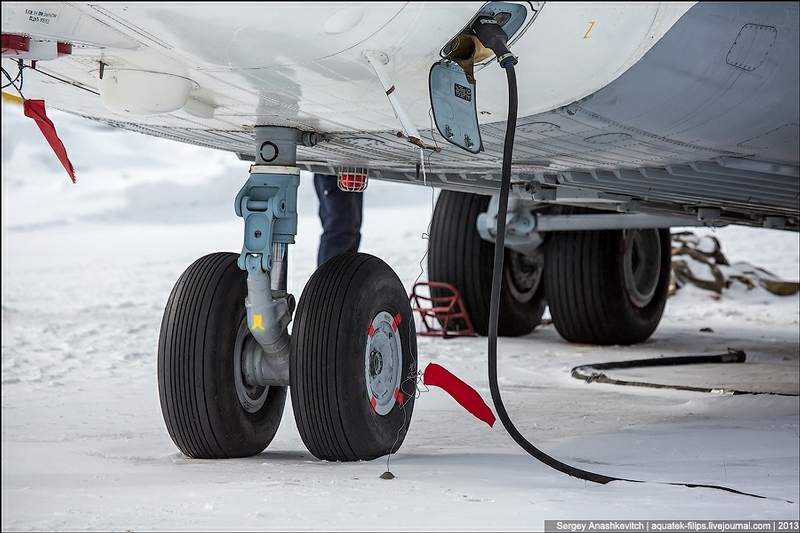 The diameter of its screw is as much as 4 meters longer than the wingspan of a Boeing 737 of the classic series. This flying monster can be compared with an ant. 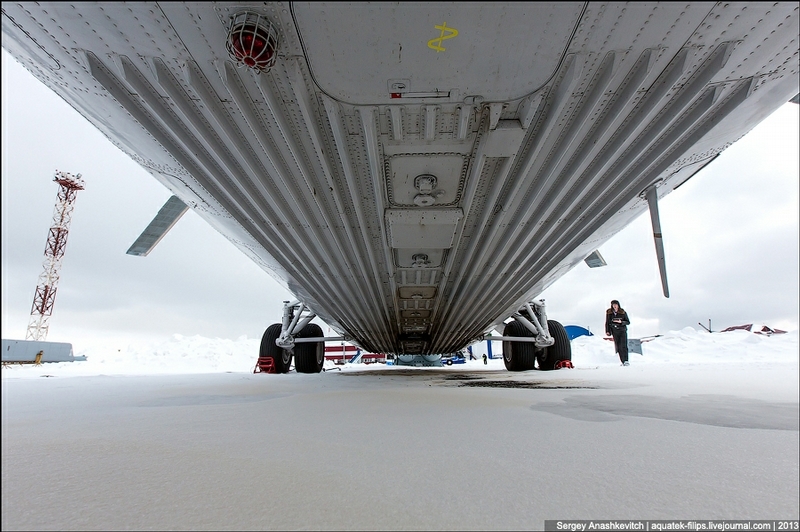 Because it is one of the few vehicles able to lift and transport a cargo of the weight comparable with its own. The distance at which such a cargo can be transported is up to 800 km! This helicopter was designed in the middle of the 70s and it’s still produced in many modificaions – as a military and transport one, as a passenger, passenger-transport one, as a flying crane, as a medical one etc. 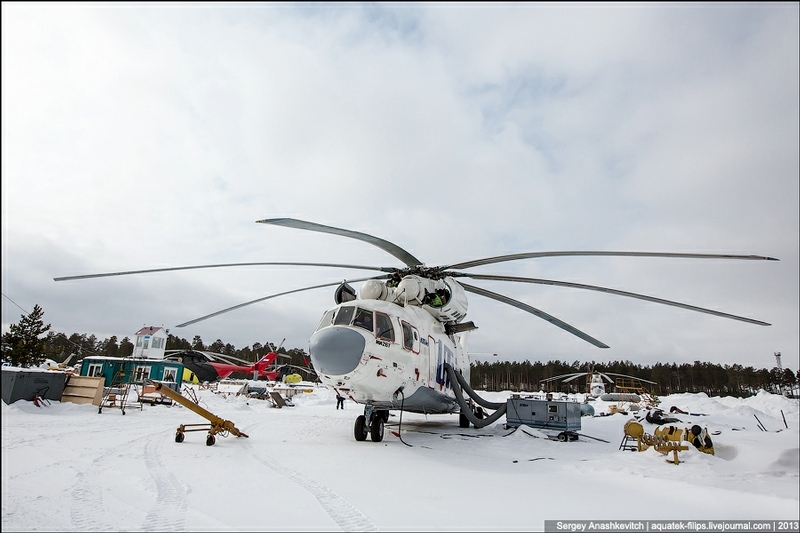 Three hundred of Mi-26 units produced for these years have been used for military and civil services in various countries – Russia, Ukraine, Venezuela, India, China and even in Laos and Peru. 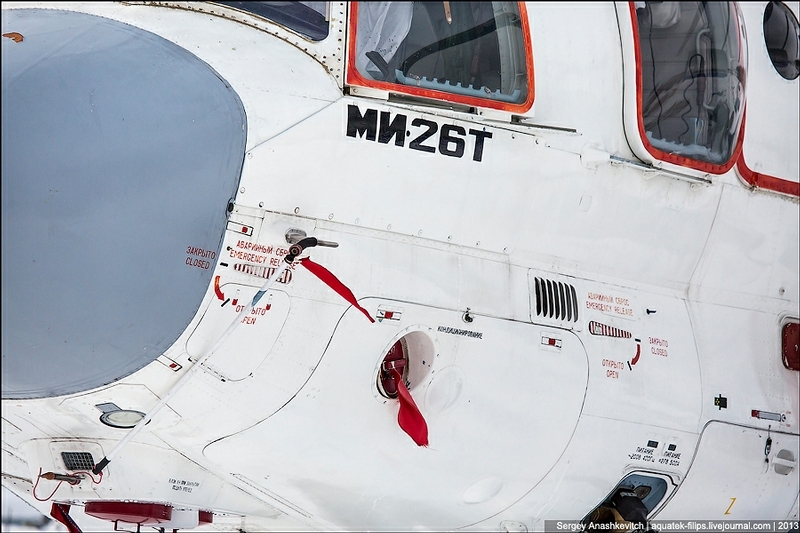 From the very beginning Mi-26 was intended to replace the record-breaker of that time Mi-6. 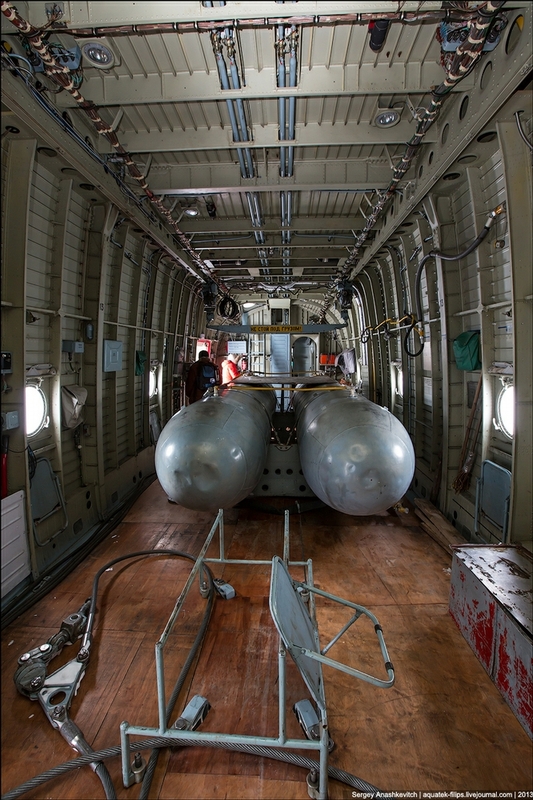 According to the requirements the new helicopter had to transport cargoes weighing up to twenty tons at the distance of 500 kilometres and perform military and civil tasks at the heights of 1000 meters above sea level. The first flight was performed in December 14th, 1977 and spent three minutes in the air. 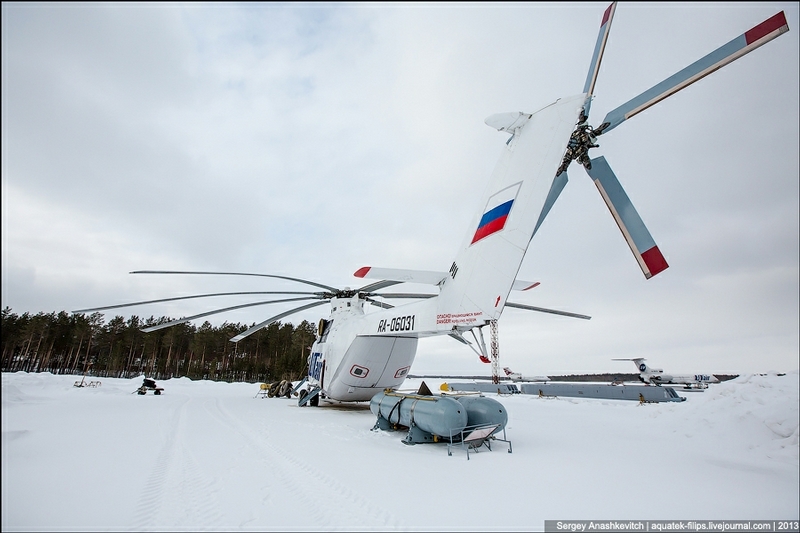 The first Mi-26 helicopters were used for military purposes. Civil ones started to be made in a couple of years. Mi-26T helicopter with the tail number RA-06031 was made in August, 1st, 1990. 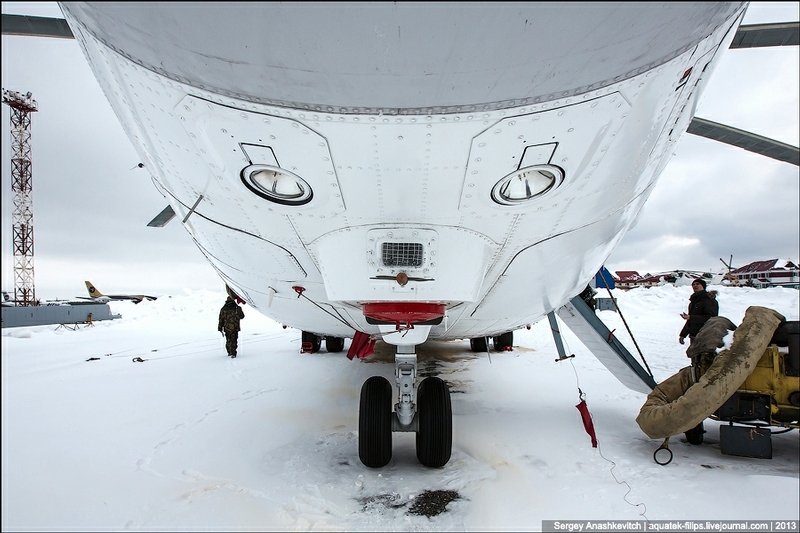 It was used by Aeroflot USSR in Tyumen and Nizhnevartovsk for three years. 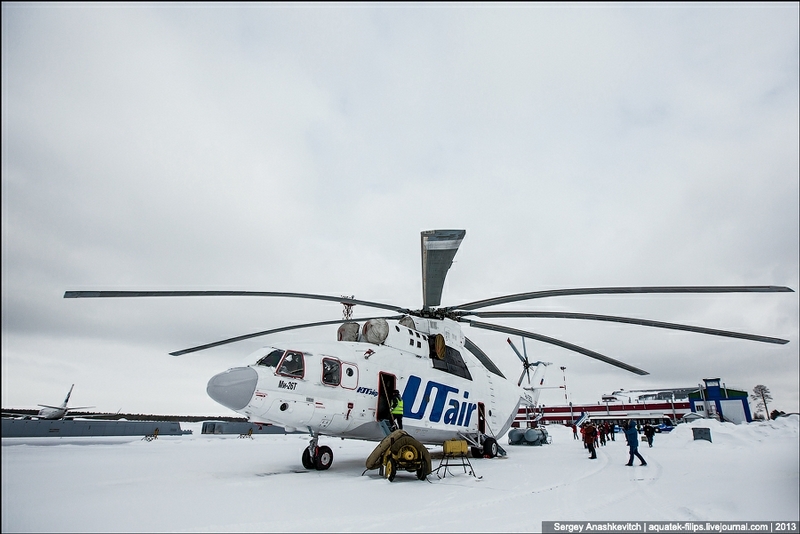 Then it was mothballed in Krasnoyarsk for a long period of seventeen years till it was bought by UTair company in 2010. Today it is being used in the region of Khanty-Mansiisk. Its permanent home today is the airport of Surgut. Civil versions of the helicopter – Mi26T were started to be made in 1985 and the main thing which distinguished it from the military versions was navigation. Universal stabilizing platform has increased the speed of transportation of bulky and long cargoes on the external load up to 200 km/h and decrese fuel consumption for 30%. It was also improved to work with pipes of bigger diameters and transport timber in mountainous areas. 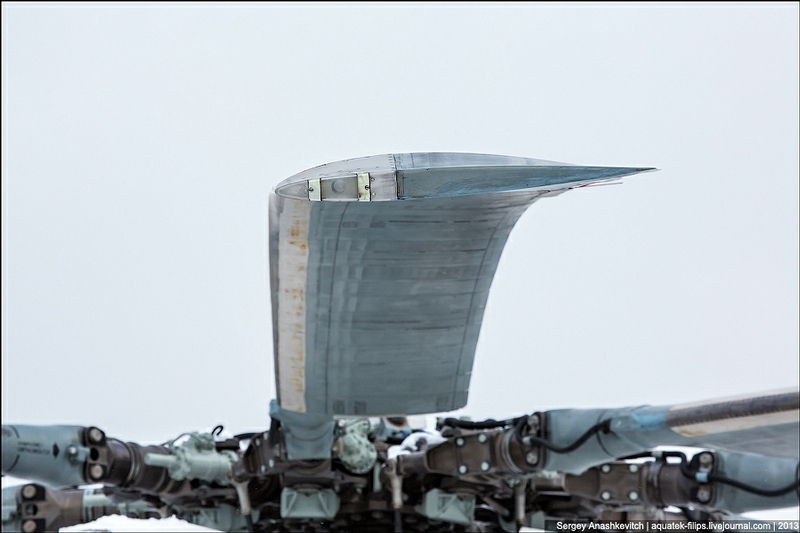 Even before being used by the armed forces and in Aeroflot it had broken some world records. For example, in 1982 it lifted a 25 tonned cargo at the height of 4060 meters, and it also flew up at the height of 2000 meters with the flying weight of 56 768,8 kilograms which was record-breaking as well. There were other numerous records. 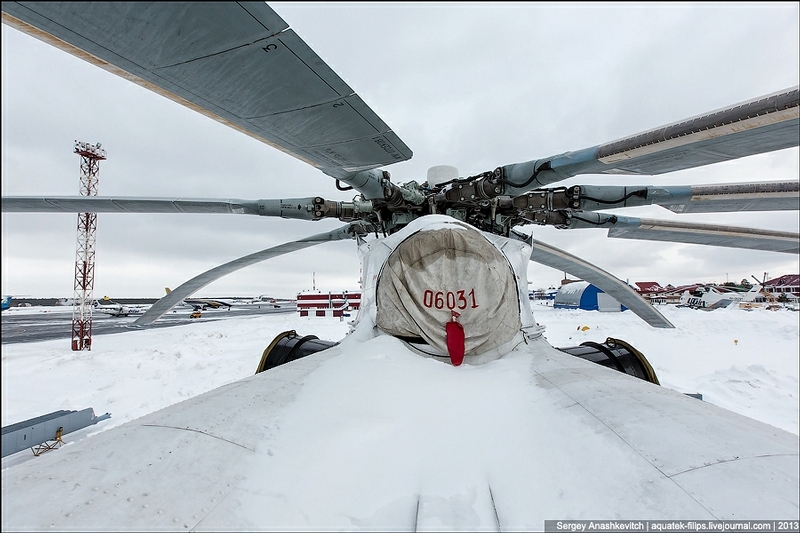 The first Mi-26T appeared in the Aeroflot company in 1986. They needed to train new comand pilots, co-pilots, navigators, operators and panel operators. When those helicopters flew the time between overhauls they were sent to the Konotopsky repair factory where they are still are. 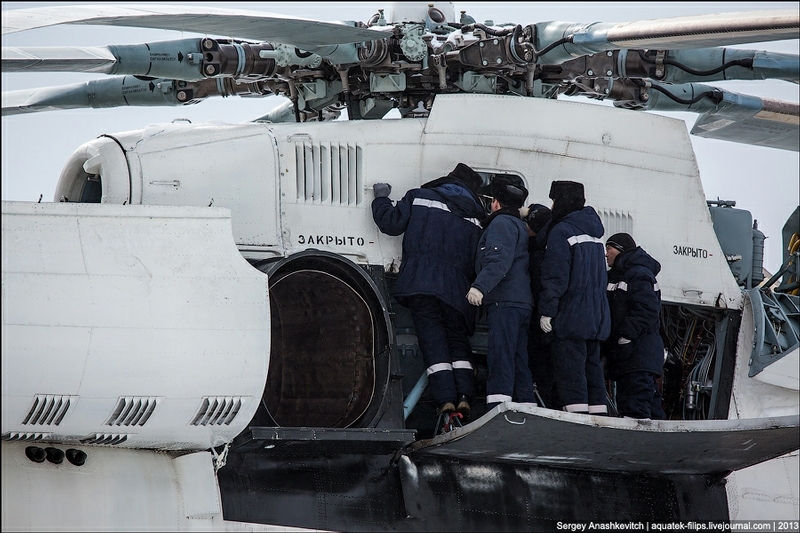 In the central part of the fuselage of Mi-26 is a roomy cargo compartment with the rear part leading to the tail boom. The cabin length is 12.1 m (with ladder – 15m), width – 3.2 m, and the height ranges from 2.95 to 3.17 m. Such dimensions let the helicopter carry any military equipment weighing up to 20 tons, intended to equip the mechanized infantry divisions, such as infantry fighting vehicles, self-propelled howitzers, armored reconnaissance vehicles, etc. 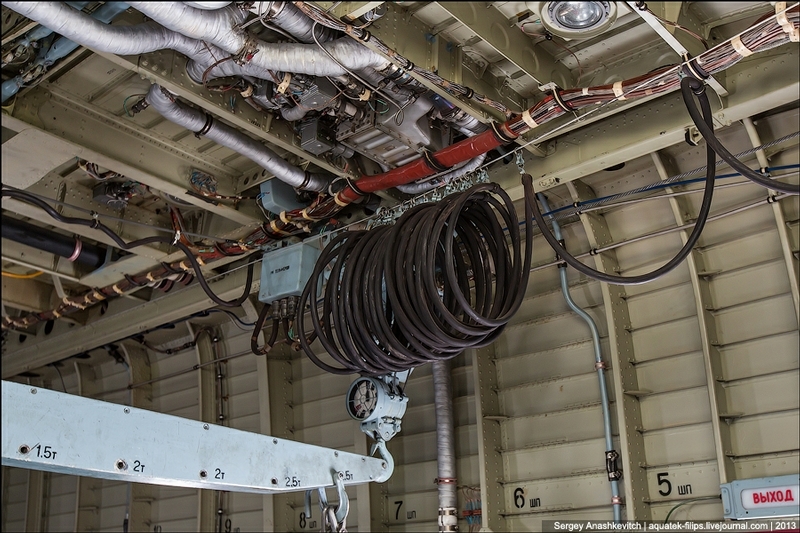 There is a set of equipment necessary for placement and fixation of goods in the cargo compartment. Mi-26 of the troop version could carry 82 soldiers and 68 paratroopers. It took several hours to turn the helicopter into the medical one for carrying 60 injured persons on stretchers and three medical workers. 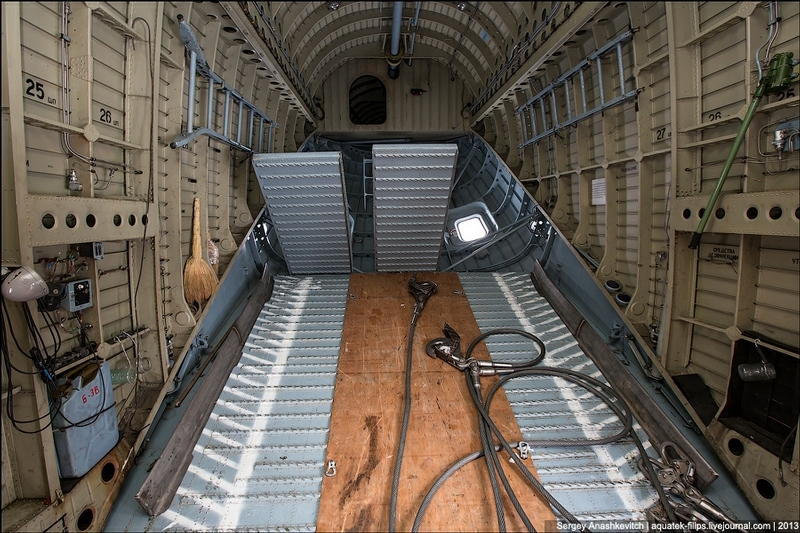 Apart from cargoes, the cargo compartment allows to accomodate additional fuel tanks and increase the range of the flight. The ability to carry large-size cargoes on the external load was very helpful for the civil purposes. Many operations became unique and famous all over the world, they contributed much to the reputation of the helicopter. 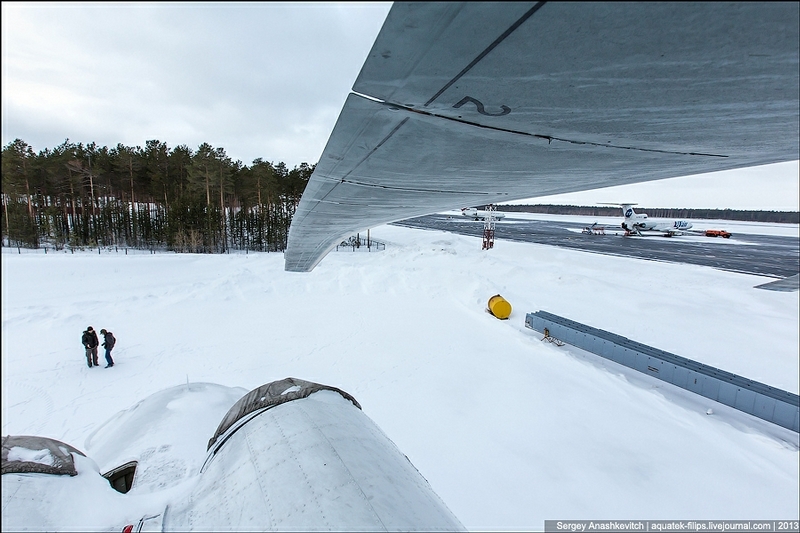 One of them was a winter transportation of the plane Tu-124SH with mass of 18 tons in 1986. Or evacuation of Be-12 plane from the site of the forced landing in the Rostov region and its transportation to Taganrog. Similar operations were performed abroad too. 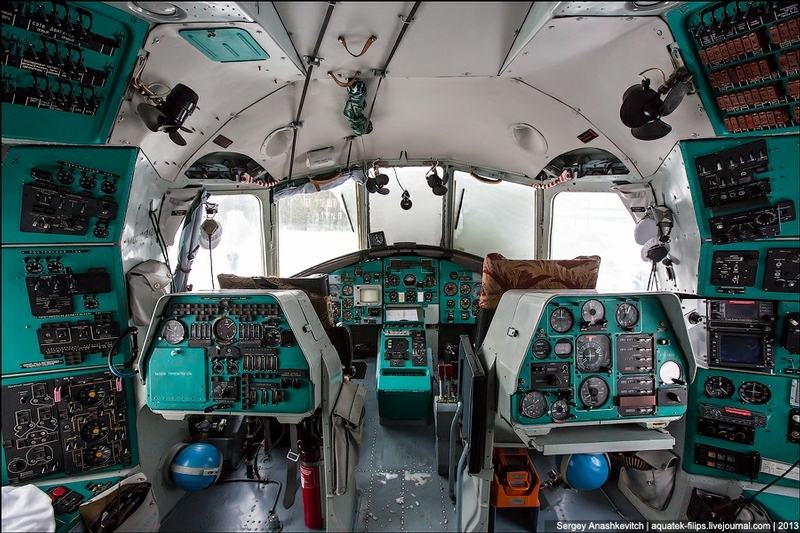 The cabin of the pilot. 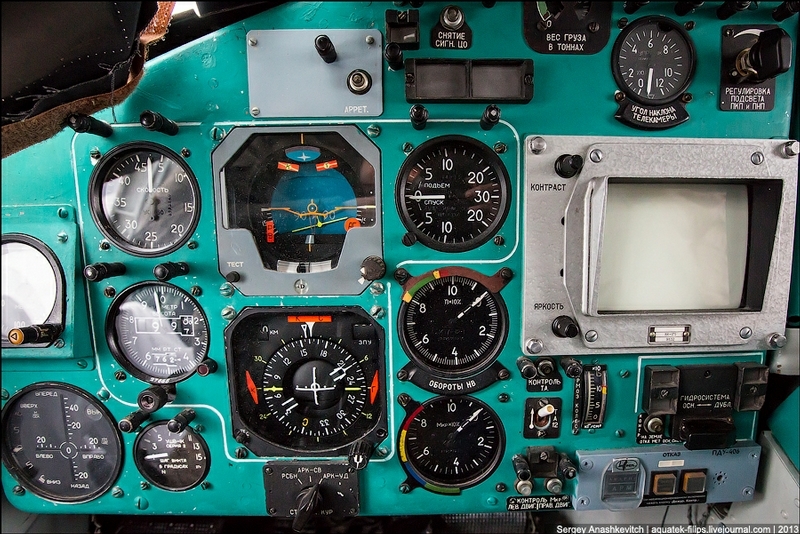 Its avionics and navigation equipment enables the helicopter to perform combat missions in bad weather and at any time of a day. The power of the helicopter is 22 000 hp. 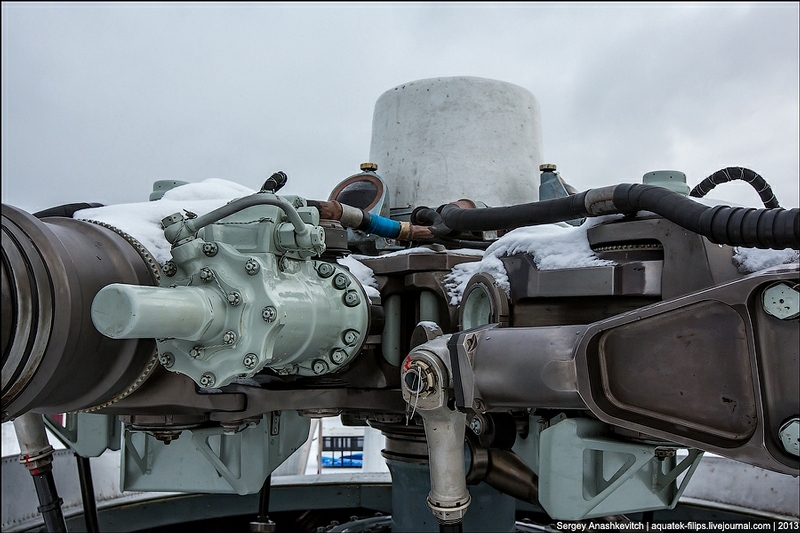 The helicopter’s engines allow to lift a vehicle of 28 tons loaded with 12 tons of fuel and 20 tons of cargo at the height of 6,5 thousand meters and transporting them at the distance from 800 km (fully loaded) to 2350 km (ferry flight). 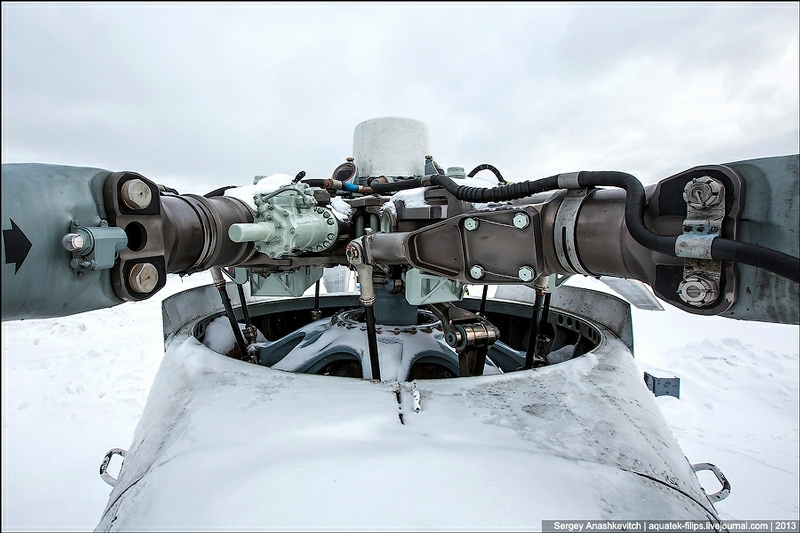 Its engine consumes up to 3100 kg an hour while a flying hour costs about 20 000 dollars. 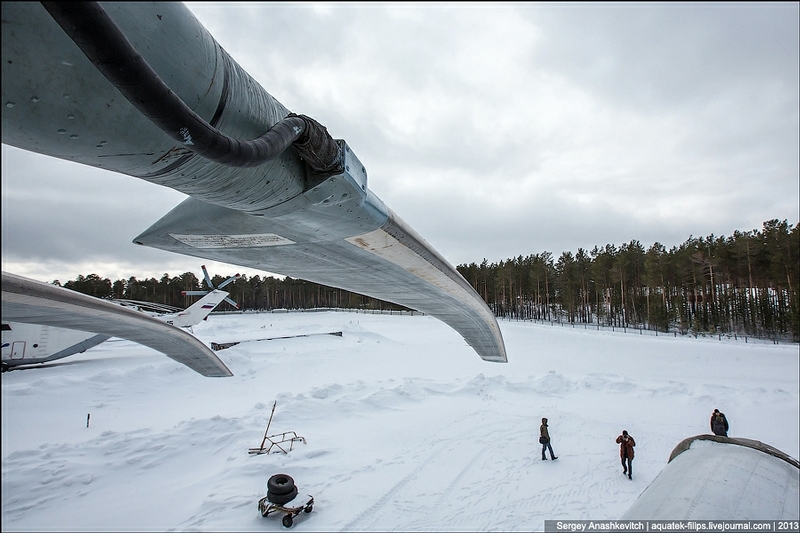 The incredible huge thing with eight 16-meter blades. Compare its size to the size of people. Main rotor blades are also as big as hell! They look like fingers of any fantastic robot. When the helicopter flies the blade straightens under the impact of various physical forces and sometimes it even seems it bends up. 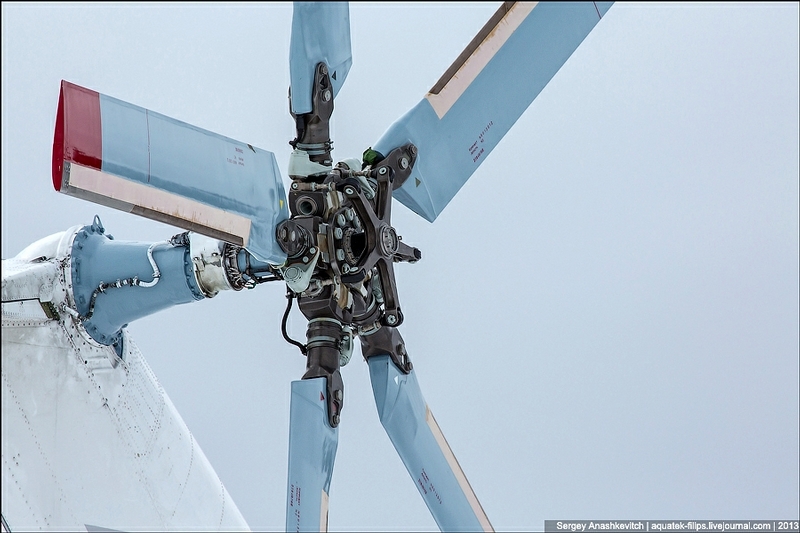 The tail rotor is much smaller than the main screw but its size is compared to the height of a three storey building! Amazing machine – I wasn’t aware that a cost of one hour would be that much. We definitely need some new propulsion. Oh my god! I want one so bad! Many people still believe helicopter was invented by the American’s: but I real know was invented by the Russia’s, also toilets in the planes too. It’s loved knowing what such machine could do, but would be real nice if was only in peace times. I’m not with sympathy just for no reason, only I wish could change human mind, when their love wars and instigate terrorism all over the world, special in Syria now. The suffering is tremendous and that the organizers not understand human feelings. As so often is the case both Russians and Americans try to take credit for other people’s inventions. The first working helicopter to perform controlled flight with a pilot on board was “Gyroplane Laboratoire” Built by Louis Breguet that first flew on 26 june 1935.